This quilt is still my most popular pattern. People love how quick it is to cut out and sew together. 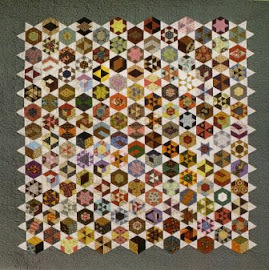 All you need is 12 fat quarters, cut into 12 pieces with one piece in each of 12 blocks. The bonus is there are no points in the blocks to line up, I can sew a block together in 5 minutes. Today a lady rang me for the pattern after winning the quilt in a raffle, she loves it so much she wants to make one herself! You can make the quilt bigger by using more fat quarters. I am now collecting 20 Japanese fabrics fat 1/4's to make a queensize one!